Vaccines are one of the most important and most efficient inventions in the history of medicine, if not the history of mankind. As vaccines started to become widely available in the 1960s, the incidence of many dangerous and even fatal diseases such as polio and measles was greatly reduced. The way vaccines work is an amazing process: when a child or adult receives a vaccine for a specific disease, their body builds protection against that disease, which means they are ready to face the disease with minimal (if at all, any) symptoms in the case of an outbreak or if they come into contact with someone who has the disease. That’s because a vaccine works by preparing the body to face a particular disease using our own immune system. Vaccines do not contain the live virus or bacteria that cause the disease but rather bits and pieces or a small amount of a weakened or dead bacteria or virus. 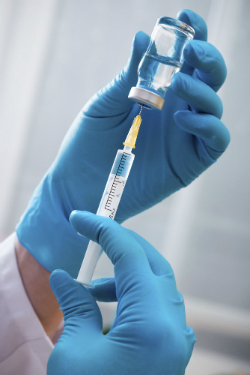 The right ingredients: Vaccines are prepared so that they can be given by injection. The vaccine ingredients—for example, those found in the Measles, Mumps, Rubella (MMR) vaccine—prepare the body to recognize and control the actual germs that cause these diseases. Triggering a natural immune response: The vaccine is not strong enough to bring on a case of the disease, but it allows the body to start developing antibodies against these diseases. Ready for defense: These antibodies will then be in the person’s body ready to fight the real disease if they ever come in contact with it. This is known as immunity to a disease and it is the goal of all vaccines. Most antibodies developed as a result of vaccines provide long-term protection against the disease. It’s important to note, however, that some vaccines require more than one dose for the body to develop its immunity. For example, the ‘diphtheria-tetanus-whooping cough-polio-haemophilus influenzae B’ vaccine must be administered in four doses when the child is two, four, six and 18 months old. There are also vaccines that require booster shots later in life to ensure that our immune system remembers the disease it is supposed to target. Looking for more information about your child’s immunization schedule? The Quebec vaccination schedule and protocol has complete, up-to-date information on when your child should receive their vaccines.